Fields of gold and orange poppies swaying in the breeze are a spectacular sight in spring when California’s landscape blooms with a mosaic of colorful wildflowers and shrubs. Winter rains determine the intensity and duration of wildflowers such as poppies, lupine, cream cups and towering ocotillos. Round up the kids, pack a picnic and bring your camera. Masses of poppies grow in this western Mojave Desert 15 miles west of Lancaster, a stone’s throw from Los Angeles. Other wildflowers include owl’s clover, goldfields, and the scented grape soda lupine found along the Tehachapi Vista Trail. Singing meadow larks and hawks break the silence of the quiet countryside. During the wildflower season, the nearby Jane S. Pinheiro Interpretive Center shows a short video, and offers free guided tours. Shaded picnic tables available. Seven miles west of the Poppy Reserve is the Arthur B. Ripley Desert Woodland State Park, where a native Joshua Tree and Juniper Woodland are among the last standing in this habitat that once spread across the Antelope Valley. http://www.parks.ca.gov. A variety of flowers at different elevations brighten the park’s two deserts – the higher Mojave Desert and lower Colorado Desert. Wildflowers usually begin blooming in the lower elevations of the Pinto Basin and along the park’s south boundary around February, and at higher elevations in March and April. Where there are clusters of rocks, expect plenty of wildflowers. Seen throughout the park is the desert dandelion, a hearty flower that forms brilliant patches of gold across the landscape. The flowers are yellow and some have a red dot in the center. Look carefully, you may even see a desert tortoise snacking on one! For flower updates, call the Joshua Tree National Park 760-367-5500 or visit www.nps.gov/jotr and www.twitter.com/joshuatreenp. California’s largest state park, encompassing more than 600,000 acres, has one of the most spectacular wildflower displays in the west. Here you’ll find a kaleidoscope of flowers from tiny bursts of color and gold poppies to towering ocotillos sprouting fiery spines of scarlet blossoms. The canyons west of Borrego Springs usually have a pageant of wildflowers and colorful clumps of beavertail cactus that sprout hot pink flowers. At Desert Gardens, five miles north of the visitor center, park along the road and explore desert dandelion and desert pincushion blanketing the washes. For information, call the Wildflower Hotline at 760-767-4684 or visit http://www.parks.ca.gov. 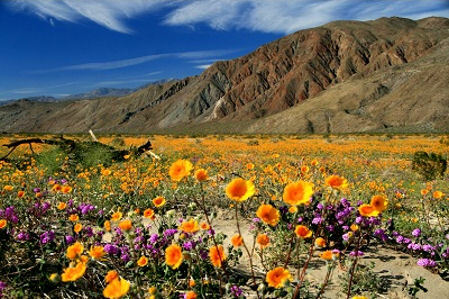 FYI: California Overland (www.californiaoverland.com) offers Wildflower Adventure Tours aboard open-air vehicles into Anza-Borrego Desert’s palm oases and canyons through early April. An easy jaunt from the city is Franklin Canyon Park, where peaceful trails meander through fields of blue and white flowers, poppies, sticky leaf monkey flowers, canyon sunflowers and purple nightshade. http://www.lamountains.com. Situated on 22 acres, the Theodore Payne Foundation operates a California native plant nursery and offers classes but is also popular for its Wildflower Hill. A short walk leads to buckwheat, sage brush, white sage, sugarbrush, sticky monkey leaf flower, elegant clarkia, gilia and showy penstemon. For 30 years the nonprofit organization has provided a wildflower hotline for the latest flora blooms at 818-768-3533. The website’s Wildflower Hill link provides detailed monthly reports. Amenities: Picnic tables in the sycamore grove, restrooms. Located at 10459 Tuxford St. Sun Valley; www.theodorepayne.org. Eaton Canyon Natural Area has trails brimming with black sage, honeysuckle and yellow pincushion. 1750 N. Altadena Drive, Pasadena; http://www.ecnca.org/. Placerita Canyon Nature Center: There’s usually a good showing of elderberries, golden currant and large bush poppy on the two-mile (one way) Canyon Trail. 19152 Placerita Canyon Road, Newhall; www.placerita.org. Among Descanso Gardens’ many themed areas is the eight-acre California Garden, featuring native plants and the showy matilija poppy. 1418 Descanso Drive, La Canada-Flintridge; www.descansogardens.org. Los Angeles Arboretum & Botanic Garden: Free admission third Tuesday of the month; 302 North Baldwin Ave., Arcadia; www.arboretum.org. The Huntington: Free the first Thursday of every month with advance tickets; 1151 Oxford Road, San Marino; www.huntington.org. For more travel stories, follow Mimi on Twitter @mimitravelz.